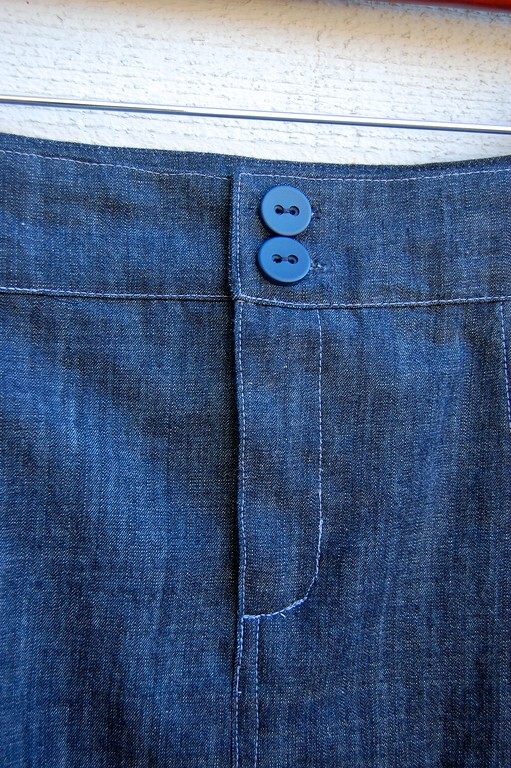 Last year I bought some indigo denim to make myself a skirt. I whined about my inspirational piece in this post, and then became discouraged for the next half a year because I couldn't find a design I actually liked. The accompanying description was vague but I had the photo to work with, so I got to work. Finished it last week. Whoo! Finally, finally, a skirt that isn't my standard A-Line! to make it less boring. I used 3/4 yard of a soft, drapey indigo denim. I probably should have bought a whole yard, just to make the layout easier, but I hate scraps, so I bought exactly what I needed. I used almost every square inch of that 3/4 yard. There is no lining, because the denim has a nice enough weight. I did use that good acetate lining to line and face the slash inset pockets, though. which I fiddled about with a little too much, trying to get the shape of that curve perfect. So now I have ugly stitches. Serves me right. I couldn't bear to use the traditional brown jeans thread (too rugged), so I did all the top-stitching in regular slate blue sewing thread. Here I am sticking my belly out - how rude - in the only shot I have that shows a near-frontal view. The draft was quite easy. 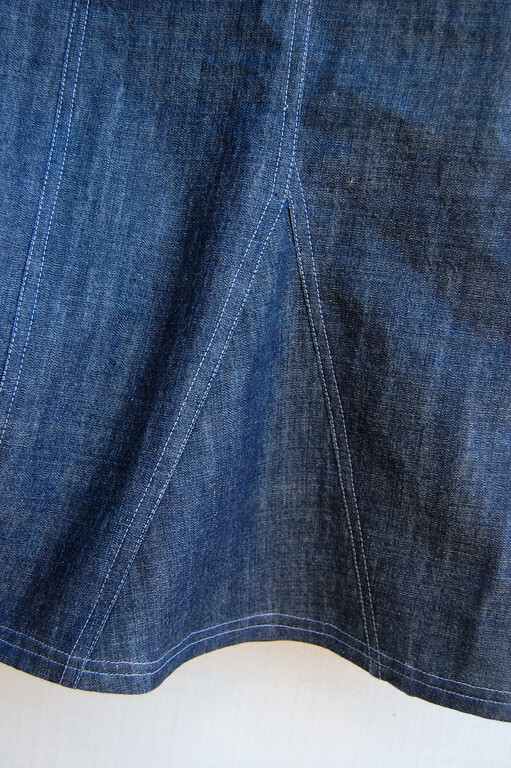 The top half follows the draft of a traditional straight skirt. I divided the whole skirt into 8 vertical panels which, from mid-thigh down, I cut in to insert 4 godets. Here's the back of the skirt - see the seam where you'd normally see back waist darts? They were built into the seam i.e. I shaped the top of those two panels to taper towards the top by the same amount as a waist dart. Sorry if I'm not making sense. 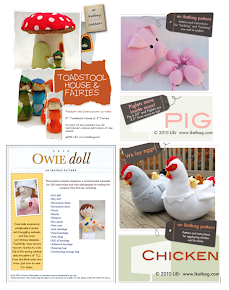 If you're used to sewing darts or paneled skirts, you'll probably know what I'm talking about. Anyway, the point was to not have visible darts, which would be just hideous in this kind of design. The center back, incidentally, doesn't sink in like in this photo. I was standing funny and sticking my hip out so the camera could get that seam. And that's basically it! Before I saw the finished skirt, I thought I would hate it because it was, I dunno, flouncy but I was wrong. And happily so. I am going to enjoy wearing it this summer! P.S. I know you might ask for a tutorial, and I will apologize in advance, but no. Best if you find a commercial pattern for something like this and work from there. It's quite a basic design. There are so many variables to consider to get this to fit individual wearers that a tutorial wouldn't work. What a beautiful skirt! I love the look of the godets, adds a bit of class! For some reason, only some of your photos are showing up on the Google Reader (and now on this page.) Thought you might want to know. I see blouses of floral cotton lawn and bright solid tanks with this all summer. Beautiful. Very nice, love the flat felled seams and totally agree with the 'traditional' brown top-stitching, the blue makes the skirt a bit more more feminine which works perfectly with the godets (never know how to pronounce that word!) Job well done! great skirt, i love it!! I love the shape and fit. And that double row of stitches. 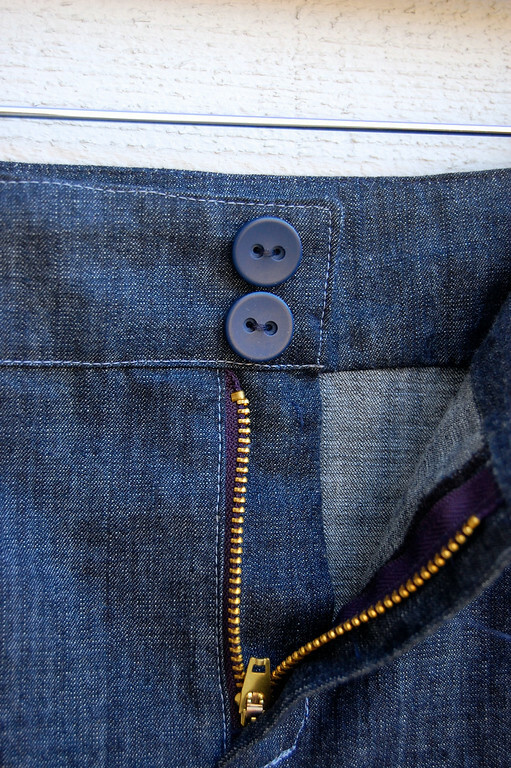 May you share how to make zipper front fly? I get tired of sewing pants and skirts with elastic and want to try zipper or button front fly. I´ve searched for a such tutorial for a long time but I haven´t found any tutorial that is quite easy to understand. Thanks a lot! Beautiful! I purchased a skirt very very similar to this last year and love it. The way it lays and diverts your eye away from the hip/tummy area. It's been a while since I've made any clothing items but I have a question. I always followed a pattern to the T, was never comfortable altering it, which is the beauty of making it from scratch. Could you do a post or give some ideas about how you make a skirt/shirt, etc... custom fit? You are such a talented seamstress I'm sure it's simple for you but me being an amateur I am afraid of ruining the fabric/outfit. Love your blog and thank you. truly gorgeous work. Very well done. You are a true professional. BEAUTIFUL!!!! I have some denim that would look perfect in a skirt like that - will have to start hunting to find something similar. It's beautiful ! It was well worth the 6 months waiting time to get it right. Bravo! It's wonderful when you can translate an idea into reality. The fit of the skirt is very flattering. I always thought it rhymed with "go-get". But hm. So went to check it up after reading your comment, and yes, it does rhyme with "go- get", with emphasis on the "det". I just learned a new sewing word! "godet"
You have amazing design skills, LiEr. Long time lurker and first time poster. The skirt looks wonderful. I agree with the poster who wanted a tutorial about a fly front zipper. Also, a tutorial about plackets, especially the ones on the back would be great. your skirt came out beautifully! 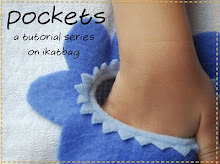 there are lots of tutorials online for people who want to learn how to sew in godets! just google it! Love, love love! Nice to see 'grown up' clothes for a change. Your skirt is perfect! Very nice! The godets just 'make' the skirt! It looks fantastic! Very, very nice. Great skirt. I took a recycled refashion class and took 2 pairs of jeans and converted it into a jean skirt. I look forward to seeing your newest creations and being a follower. 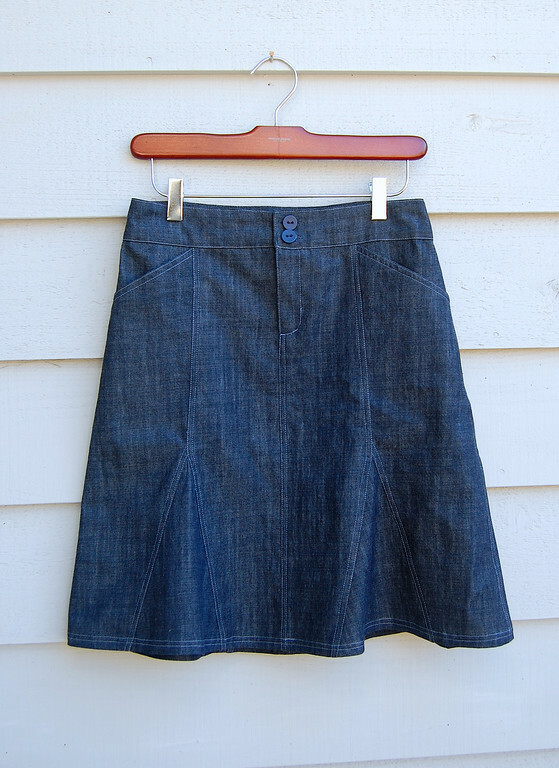 I have a similar denim skirt, I bought it 7 or 8 years ago and wear it frequently, it just fits so well. Nice skirt! The blue top-stitching looks nice, dressier then brown would've been. Love the godets too, I'll have to give them a try sometime. It looks great! I bought myself some denim, with the idea that I might try a skirt (a way of easing into skirt-wearing for a t-shirt and jeans girl like me...), but it's been sitting on the shelf for a while. Super cute skirt! Love the stitching detail in the light thread! I love seeing pictures of the "woman behind the curtain"...even if it was just your bottom half! This skirt is perfect! Love the shape and style. I really like your skirt. I love, love, love denim. I'm a bit of a cowgirl, though. 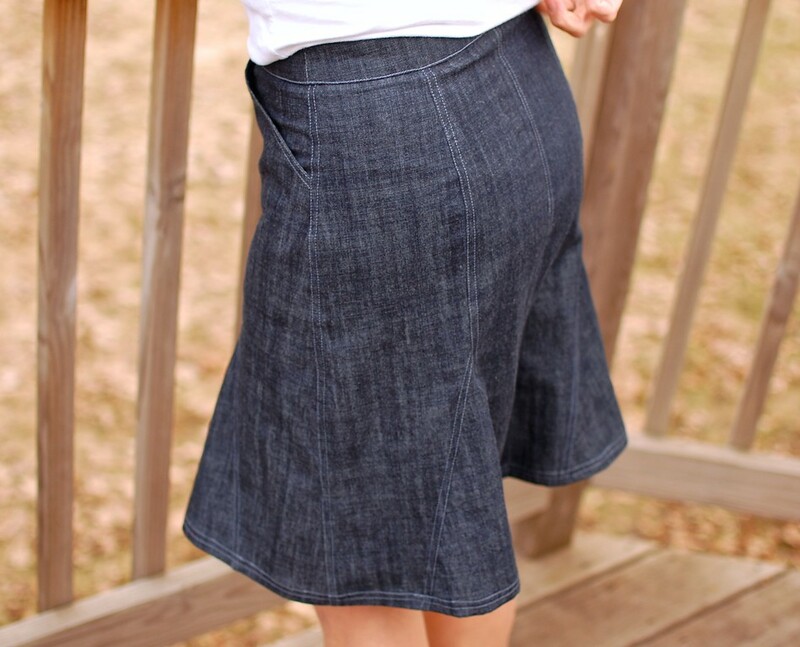 I have made three denim skirts kind of like this for myself. I made a pattern from a skirt I really liked that I found at the thrift store. It's an eight gore with buttons down the front and stitched rounded pockets on the front. I used flat felled seams (I think that's what their called) and did the stitching on the right side in white with a thicker thread. I may try something with godets for a more dressy look next. What weight denim did you use? I have used only a really heavy weight denim and it's hard work to sew with. You don't want to make another right away! Also the seams start to fall apart a bit after a year of nearly constant wear. Thank you for all the helpful tutorials and inspiring posts on you blog. I discovered it a few weeks ago and I'm hooked. I have been going through all of your posts one by one. I don't want to miss any!! Emily, your skirts sound lovely! Nothing is quite like denim for being simultaneously casual, rugged and smart. I don't know how to describe the weight of denim I used for this skirt. It's certainly not as thick as typical jeans denim. It reminds me of a thick linen or a thin twill. It's very soft. I imagine it's similar to what is used for a ladies' denim shirt. Also I didn't use real flat fell seams (which are the kind whose seam allowance you halve, and then fold over so that the wrong side looks like the right side). I simply folded the seam allowance (wrong side) to one side of the seam, and doublte-top-stitched on the right side. So you can still see the serged seam allowance on the wrong side. It's a lot less work than flat fell seams, which can be hard to sew in denim unless you have an industrial strength machine. I was just about to ask if those were real flat felled seams, or a faked version. Did you use a double needle, or did you just sew the top stitching twice? I like the look of this skirt - it could be casual or dressy. I think I'll have to file it in my "things I might try sewing once winter is over" pile. 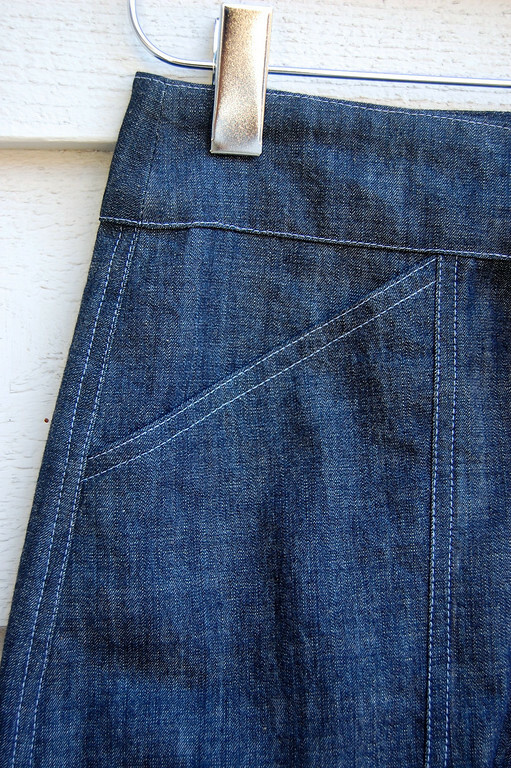 I've never sewn with denim and things might be something not too difficult to try. I'm crying. Your Mom brought you through the door, and you walked through mastering her mastery as couturière. My daughter's home ec teacher was very much like your mom: perfection only. Your teenage wardrobe, especially the dresses are simply gorgeous. Your attention to detail, thanks to Mom. I am self taught as a sewer when my daughter was liittle, and I was a stay at home home. I'm still struggling with certain sewing concepts, but haven't given up. Last year I began to make my own simple patterns. Oh! 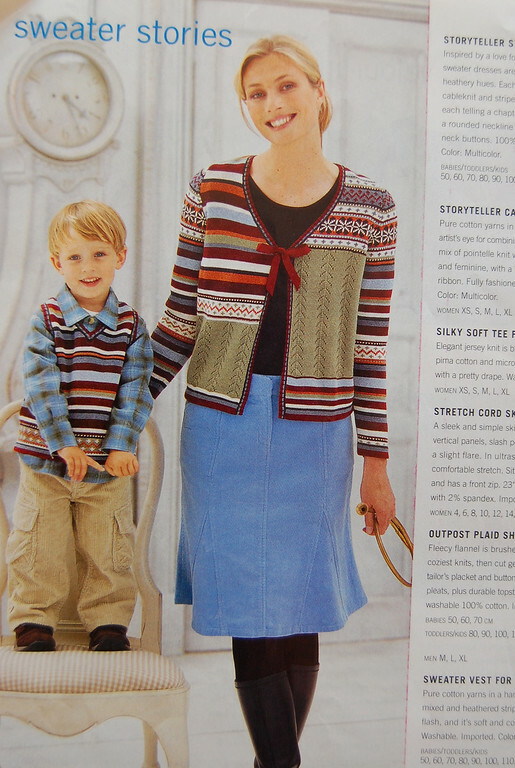 that denim skirt; If you ever decide to make a pattern for purchase, I'm in. You are truly an inspiration. Thank you for sharing so intimate a sewing experience with Mom.